U.S. Senate candidate Jim Renacci talks with Becky Magrum Sunday inside the Allen County Republican Party booth at the Allen County Fair. 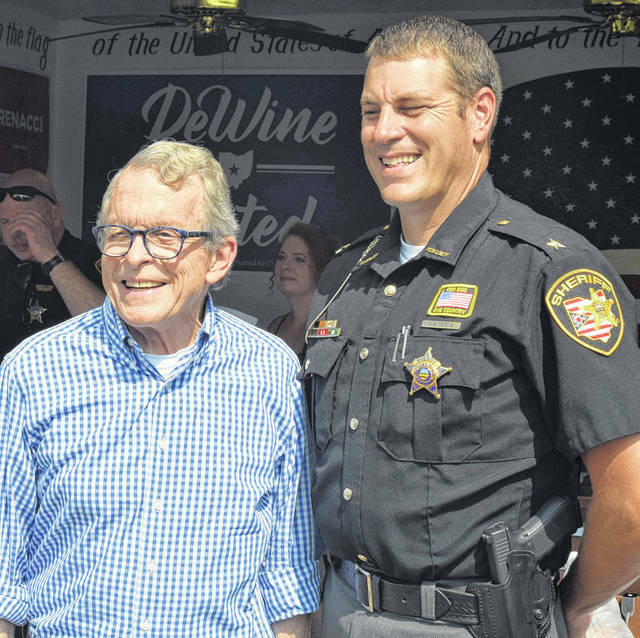 Ohio Attorney General and Republican gubernatorial candidate Mike DeWine poses with Allen County Sheriff Matt Treglia at the GOP booth at the Allen County Fair. LIMA — The relationship between politicians and the county fair seems about as American as a Norman Rockwell painting. Politicians have long been taking advantage of the opportunity to mingle and kiss some babies as they meet potential voters. Sunday was no exception at the Allen County Fair as two big names in Ohio Republican politics were campaigning between swigs of Lemon Shake-Ups. U.S. Senate candidate Jim Renacci and current Attorney General Mike DeWine, who also wants to be Ohio’s next governor, made appearances at the fair, strolling down the midway with their entourage of assistants and armed guards, posing for pictures with anyone who would speak with them and just finding out what are the concerns of people in Allen County. With Allen County historically a stronghold for the Republican Party, both candidates received a warm welcome from fair goers. “You know what a day like this does for me? It really allows me to get a sense of a pulse, what people are thinking about, what they’re concerned about because when you see somebody at the fair, and my wife Fran and I walk up to them [and] they’re casual. We’re at a fair. We’re having fun. If they’ve got a problem, they’ll tell me about it. If they’ve got something that they want me to focus on, they’ll tell me about it,” said DeWine. 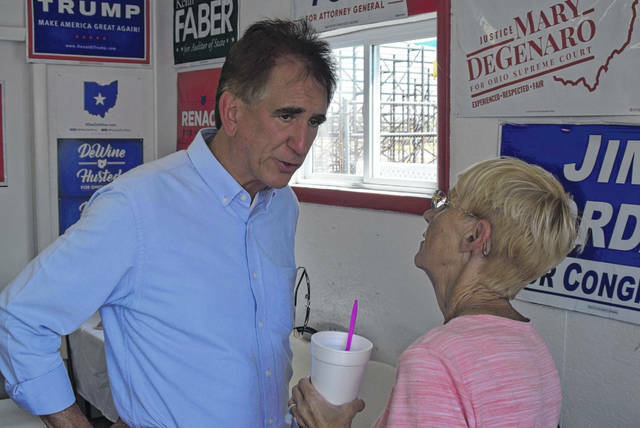 While DeWine has been to the fair many times over the years, Renacci is trying to register with prospective voters. “It’s always good to get out and get people to know me. A lot of people say they’ve seen my face. They’ve seen my name, but they haven’t gotten to know me. We’ve been trying to get around. Actually, this is my second time. I was here last year at the Allen County Fair, too. That’s the key, just getting people to know who I am and getting to know the differences. There is a big difference between Sherrod Brown and Jim Renacci, and when people see that difference, they actually want to vote for me. So the goal is just to get more and more people to get to know me,” said Renacci. DeWine faces Richard Cordray in the governor’s race in the November General Election. Renacci faces current U.S. Sen. Sherrod Brown, D-Ohio, for the race for the Senate. Earlier in the day, both candidates were campaigning for votes at the Darke County Fair in Greenville.